I made a jacket! And I wasn’t scared at all! OK, I was a little scared, but not as scared as I am of muslining up a pair of jeans. I have a confession to make- when Christina first posted that she was working on a bomber jacket pattern, I felt kind of meh about it. I love jackets and I wear them all the time, but I don’t think I’ve ever owned a bomber jacket. Just the name brings up visions of Tom Cruise and Kelly McGillis sporting his and her Ray-Bans. It makes me sad I don’t have a proper pair of Ray-Bans. But then Christina posted some more pictures, and I started looking around Pinterest and I saw that 1) this pattern was going to be awesome and 2) this pattern was going to be necessary. So I started planning out the 527 bombers I obviously needed to complete my wardrobe. Check out the Pinterest board that Christina put together to help inspire you (including tester photos) Also, my face is on Pinterest now, so basically I’m famous. Intended for wovens; you’ll want something a little silky for the lining so you can slide it on easily. My lining is a mystery polyester blend. Remember that silky fabrics tend to “grow” after you cut them, and will often stop being true-to-grain. 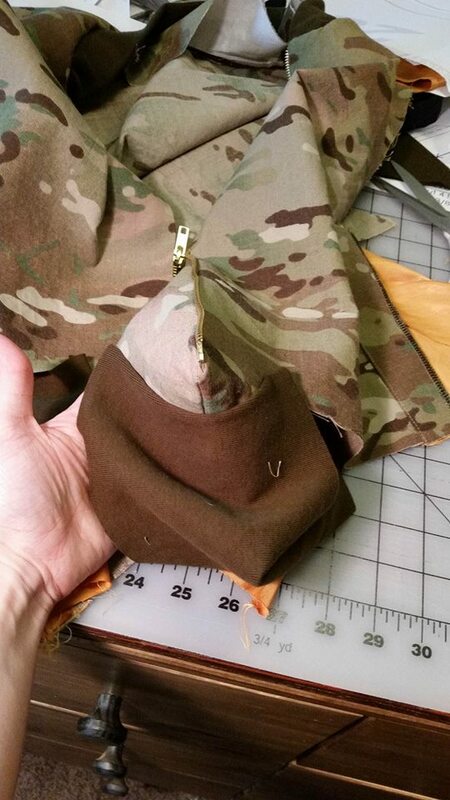 I recommend draping your lining fabric over a chair, curtain rod, door, etc for 24 hours before you cut to help it get its wiggles out, then true it to grain before cutting (tutorial linked). You do this to keep your lining from hanging and sagging oddly, and it will also help make sure it lines up well for your final sew. Sleeve cuffs, collar, and waist require a high quality rib- the firmer the better to make installation easy. Do not skimp here- it doesn’t require much, and you can always get a neutral color to keep handy for other projects. I used a mid- to heavy-weight olive baby rib knit from Michael Levine; I’m not sure on content, but it’s pretty thick, stretches well, and has good recovery. That means that it goes back to its original shape/ length after being stretched. It only stretches in one direction, perpendicular to the ribbing. You can see a picture of the ribbing in my in-process pics, below. 18-20″ separating zip. I prefer to buy longer and manually shorten. Just be sure to put a safety stopper (even if just a safety pin) on your zipper tape so you don’t take the pull off before you have the zipper ends secure. It’s a slim fit for a jacket- not at all baggy like the popular jackets from the 80s. Very, very on-trend. This is neither a quick nor easy sew. You’ll need to dedicate a couple of different sewing sessions and 4-8 hours total for the project. Read the entire pattern through before starting, then read and re-read each step before you sew. The instructions are clearly worded and well-illustrated, but there are some advanced techniques in here, like bagging a lining, and you’ll want to consider checking out extra tutorial videos that are out there. Be optimistic, and come to the Wardrobe By Me facebook group for support. Christina is on Danish time, so keep that in mind. There were a few steps in the pattern that were especially tricky, so I took some pics as I went along. This is attaching the facing to the outer jacket. The shoulder seams are to the right and left of that center curve (neckline), facing is wrong-side-up, and the rib collar is sandwiched between the jacket and facing. 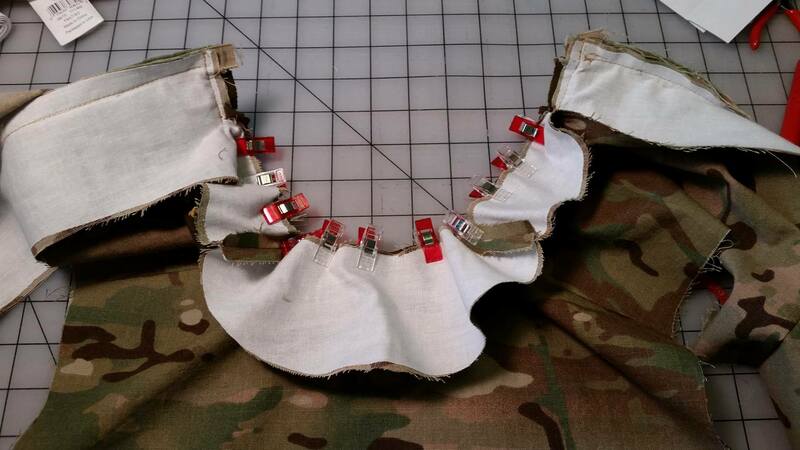 This is attaching just the short end of the ribbed waistband to the bottom extension at the end of the jacket front. You attach the 2 short ends to either side of the zipper, then the waistband just hangs out, unattached, until the last step for finishing the lining. Here’s my finished project- it fits perfectly and I have been wearing it everywhere in this cooler-than-usual Los Angeles spring. Many, many thanks to Fotogal Marj Dee for these awesome pictures! Seriously, am I cool or what? PS – Like my pants? They are the Urban Sweats, also from Wardrobe By Me in black ponte with a black vegan leather tuxedo stripe. You awsome you! Fantastic looking jacket!